Where better to learn about the intersection of math and transportation – and about transportation careers – than the biggest transportation project around? 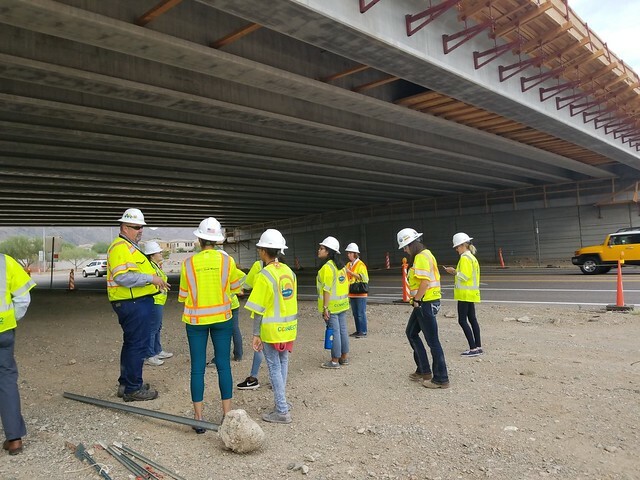 This week, several high schoolers learned about the importance of mathematics to a bridge engineer, the proper safety gear needed on a construction site and the numerous opportunities available in the transportation industry through a behind-the-scenes tour of the Loop 202 South Mountain Freeway project. The Westwood High School students are part of Transportation YOU, a hands-on, interactive program that connects young women ages 13-18 with a wide variety of transportation careers. They visited a field office in Chandler to meet with several female South Mountain Freeway engineers, safety managers and communicators. Afterward, the students donned safety gear, hopped in a bus and went on a guided tour of the Pecos segment of the South Mountain Freeway, including a stop to tour the new 17th Avenue traffic interchange. The slideshow above shows some of the highlights. “It’s good for the students to come out and actually see it,” said Tom Saxon, their teacher. “We talk about projects academically in engineering classes, but it’s always good for them to come out and see it in application, not only the scale, but also the people that do it. It’s really good to be able to interact with the people that really do it and connect the dots. The future transportation leaders also have toured the Valley Metro Light Rail expansion in Mesa and Phoenix Sky Harbor International Airport.